HGH also strengthens the connective tissues, cartilage and tendons giving athletes additional power. The bodybuilder using HGH in association with steroids significantly increases his strength whilst enjoying protection from injuries. This obviously sounds great but many who have tried HGH have found it to be ineffective for the following reasons. 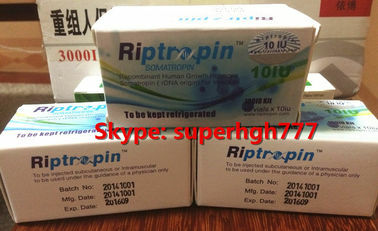 1, HGH is a relatively expensive compound and it needs to be taken regularly in sufficient amounts over a period of time. Those who take smaller dosages for economic reasons will find that it is ineffective. 2, HGH needs more anabolic steroids, thyroid hormones and insulin. The combination is – HGH, insulin, and an LT-3 thyroid hormone such as Cytomel. Only then can the liver produce and release an optimal amount of Somatomedin and insulin-like growth factors. It is widely believed that HGH only works in the presence of insulin.The duration of intake usually is much to do with the athletes financial resources. Periods vary from 6 weeks to several months. It can be used in cases of lack of natural growth hormone in children and adults. It can also be used in cases when normal levels of growth hormone are produced but above normal levels are desirable. In children it can be used when lack of natural growth hormone is produced, therefore stature problems may occur so Riptropin can be given as an aid to increase child growth. In adults it can be used in cases in which natural growth hormone have declined. It can increase muscle mass, decrease body fat and improve the skin elastically and decrease wrinkles.